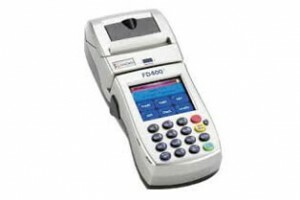 The First Data FD-400Ti terminal is a wireless, hand-held point-of-sale device that merchants can easily use remotely to provide customers with the convenience of a full range of payment options. The First DataTM FD400Ti terminal is a wireless, hand-held point-of-sale device that merchants can easily use remotely to provide customers with the convenience of a full range of payment options. You’ll have access to wireless downloads wherever you are. And with the touch-screen interface, it is an easy product to train on and use. This terminal enables you to receive the full range of solutions for payment processing, including credit, debit, gift cards, personal paper checks and EBT, all from a single provider. Plus, with the “store-and-forward” capability, you can ensure card-present rates when there is no signal at the time of the transaction. The FD400Ti terminal is light and ergonomically shaped for true mobility and flexibility. It utilizes 3G technologies to connect wirelessly over AT&T’s GPRS network, which means you’ll be getting the fastest data transmissions and more coverage area for your business. The multi-application platform supports a full range of payment and value-added services. It provides fast, efficient downloads while meeting MasterCard POS Terminal Security (PTS) requirements. No need for cash or check.